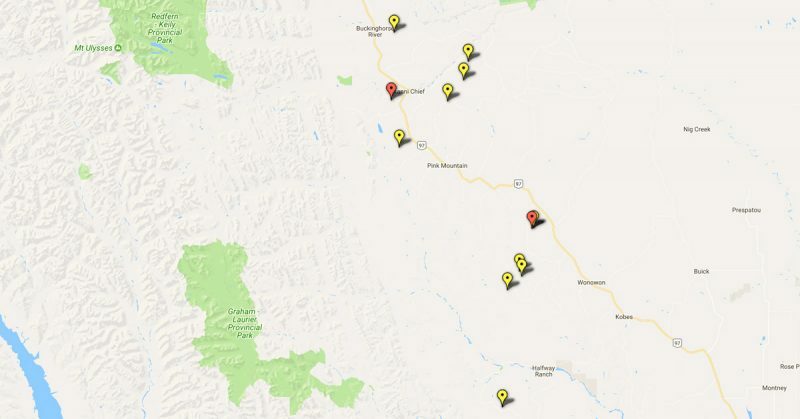 Red markers indicate dams currently being reviewed by the EAO’s office; yellow markers indicate water licences that Progress Energy applied for on December 23 of last year and where dams already existed. Please note that satellite imagery may not provide an up-to-date view of the marked locations. I sent the following letter to BC’s Environmental Assessment Office (EAO) in response to Progress Energy’s extraordinary request to retroactively exempt the Lily and Town dams from environmental reviews. Such reviews should have been conducted before the dams were built. Not only did those reviews not happen, but the company also failed to obtain other authorizations that it should have well before the dams were built. The Town dam was built in 2012. The Lily dam in 2014. Five years after the fact in one case and three years after the fact in the other, the company is asking the province to essentially say don’t worry, all is forgiven. Earlier this year I discovered that Progress Energy—a subsidiary of the Malaysian state-owned petro giant Petronas—had built at least 16 unauthorized dams in northern BC to trap hundreds of millions of gallons of water used in its controversial fracking operations. Dozens more unlicensed dams appear to also have been built in the region. My resulting exposé revealed a troubling breakdown in the regulation of an industry that uses and contaminates vast amounts of water. It called on the (then-BC Liberal) government to answer for the lack of intervention by the relevant authorities. The following letter draws on that analysis and makes recommendations relating to public safety, First Nation rights, environmental impact and accountability. I am writing in response to Progress Energy’s request to the Environmental Assessment Office (EAO) to exempt from assessment two dams that the company has already built and that should have been subject to required assessments before they ever proceeded to construction. For the reasons outlined below, I feel that the company’s exemption request should be denied. To instil public confidence in the provincial environmental assessment process, your office should conduct a thorough assessment of both facilities. It should also broaden the assessment to include related facilities and activities in light of emerging evidence of a widespread network of unauthorized or unlicensed dams built by the company and its competitors in recent years throughout northeast BC. With its application, Progress Energy is essentially asking the EAO to rule after the fact that the ongoing environmental impacts of the dams are unworthy of consideration as is the company’s decision to build the dams without following relevant environmental regulations. Not only were the company’s Lily and Town dams built without the EAO assessing the projects first, but the company that built them appears to have failed to do two other important things before proceeding to build the structures. It did not apply for water licences or submit engineering specifications to provincial Dam Safety Officers. In my capacity as a researcher and policy analyst with the Canadian Centre for Policy Alternatives, I produced the first public reports on the two dams in question and on what appeared to be widespread non-compliance with relevant provincial regulations in the face of evidence that companies had built potentially “dozens” of similar earthen dams while failing to first obtain proper provincial authorizations. My initial research on this subject was published in early May. That research noted that Progress Energy had built at least 16 large unauthorized dams. It also noted that the natural gas industry had likely built many more such dams. Subsequent information requests to the Oil and Gas Commission (OGC), Ministry of Forests, Lands and Natural Resource Operations (FLNRO), and the EAO revealed that the problem is far greater than originally reported. Documents that I subsequently obtained through Freedom of Information and other related requests (to the OGC, FLNRO and the EAO) after that first publication now show that at least 57 large, unlicensed dams were built to impound freshwater used in hydraulic fracturing or fracking operations on Crown lands in northeast BC. Progress Energy built approximately half of those dams. This vast network of unlicensed or unauthorized dams was built for one express purpose: to capture and store large volumes of freshwater used in natural gas industry hydraulic fracturing or fracking operations. Numerous more such dams were built without permits on private lands, in some cases lands in the Agricultural Land Reserve. It now falls to provincial Dam Safety Officers to retroactively approve the dams, or to order that the dams be modified to protect human health and the environment, or that they be dismantled. Retroactive determinations must also now be made on dozens of water licences that were never applied for, as required by law. It is entirely unclear at this point how provincial agencies plan to retroactively and simultaneously review dozens of unlicensed dams and rule on dozens of related water licence applications. It is equally unclear how, having failed to properly inform First Nations in the first place about what was to be built, the provincial government plans to conduct long overdue, fulsome consultations with those First Nations most directly impacted. The EAO’s office has known since last year that Progress intended to file exemption applications on its Lily and Town dams. In July, the EAO received Progress’s formal exemption applications. In August, the EAO posted Progress’s exemption applications (one for each of the two dams) on its project registry site and told members of the public that they had 28 days to respond to the company’s application. The deadline for pubic submissions was September 21. I have reviewed materials before the EAO in support of Progress’s application. I believe those documents show that there are worrisome deficiencies or emissions in what has been filed. The main report before the EAO in support of Progress’s Lily dam project (Progress Energy Lily Dam – Project Description) describes a nearly 23-metre-high earthen structure, or a dam roughly as tall as a seven-storey apartment building. The report includes a review of the structure by engineers in which some issues of concern are noted. The engineers found signs of obvious “settlement” of the dam’s walls, including “large tension cracks” at the dam’s northwest corner. All of these observations, made in December of last year, came two years after the dam was built, underscoring a key problem for the EAO and other provincial agencies. Dam designs and engineering specifications do not appear to have been fully reviewed by relevant provincial authorities before the dams were built. Recommendation 1. Progress’ exemption request to the EAO should be denied. The EAO should conduct a review of the Lily and Town dams that fully takes into account whether or not they were built to sufficient engineering standards, especially in light of why the dams are there. Are the dams built to withstand induced earthquakes? Both the Town and Lily Dams are built to store water used in natural gas industry fracking operations. Fracking operations are known to trigger earthquakes. The largest-ever induced earthquake in a natural gas industry fracking operation (magnitude 4.6) occurred in 2015 at a Progress Energy drill pad in northeast BC, in the same basin where Progress’s Town and Lily dams are located. Neither report notes, however, that BC Hydro, which has two large dams on the Peace River that are both critical public infrastructure projects and that were both subject to public oversight before and during their construction, has worked with the BC Oil and Gas Commission to create zones around its Peace River facilities, including the proposed Site C dam, where gas drilling and fracking is prohibited. The subject of induced earthquakes and their impacts on critical infrastructure such as dams is never discussed in Progress’ project description reports in the critical context that it ought to be. The very company that built the unlicensed dams is responsible for generating significant earthquakes in its own fracking operations. Moreover, the two dams and others built by the company and its competitors are purpose-built to corral large volumes of freshwater nearby where fracking operations will occur. Thus, the seismic standards to which dams are built ought to be a top public concern and assessment priority. Recommendation 2. In assessing the Progress dams, the EAO should determine whether or not the earthen structures are properly built to withstand ground motions from induced earthquakes, given their proximity to fracking operations. If the EAO determines that this is not the case, then the company should either be ordered to dismantle the facilities or re-engineer them to accepted seismic standards. The EAO should also assess whether fracking exclusion zones are warranted around the two dams specifically and other fracking dams more generally. In the Town and Lily Dam project descriptions, the dams are described as freshwater storage sites where water is to be collected for use in fracking operations. A recent report (February 2017) in the Bulletin of the Seismological Society of America suggests, however, that in one notable case, Progress Energy actually used nearly nine times more water at one of its fracking operations in the same basin. Recommendation 3. Under the Environmental Assessment Act environmental assessments can be broadened to include related facilities and activities. Given that at least 57 unlicensed fracking dams have been built to date on Crown lands in northeast BC—half of them Progress Energy dams—a broad environmental assessment is warranted that examines water usage and water demand in natural gas industry fracking operations and that fully considers cumulative environmental impacts. It is important to reiterate that the EAO has powers to broaden assessments to include related facilities and activities. A broader assessment is entirely appropriate in this case. Were First Nations consulted openly and honestly? Documents noted in Progress Energy’s Lily Dam project description as “Aboriginal Consultation Records” are absent from the record before the EAO. Some of these missing documents I subsequently obtained by request from the Oil and Gas Commission. In both the incomplete information before the EAO and in documents subsequently obtained from the OGC, the Aboriginal Consultation Records fail ever to mention the word “dam” in describing the Lily project. A pit is a hole in the ground, not a massive dam with a berm that is nearly 23 metres tall. How can “consultation” with First Nations come remotely close to meeting the most basic standards when neither the company that proposes to build the project or the provincial regulator that approves the “water storage site” (the Oil and Gas Commission) fail to provide basic, essential information about what the project is? Recommendation 4. The EAO should include in its review a broad inquiry into the consultation record regarding the two dams. What were First Nations told was to be built? If First Nations were not informed that the projects were dams, how could they have possibly foreseen that key provincial acts and regulations were at risk of being violated, to say nothing of their Constitutionally-protected and treaty-protected rights? How did the Lily and Town dams get built without being referred to the EAO first? Progress Energy’s Lily and Town dams are both over 15 metres high and fully qualify as major projects under the Environmental Assessment Act. Either field staff with the provincial Oil and Gas Commission, which regulates energy industry activities, were unaware that these large structures were being built, or they knew that they were being built but they did not consider them dams, or they knew they were being built and that they qualified as dams but did nothing about it. None of these scenarios inspires public confidence that our shared environment is being protected. For reasons that have yet to be explained, the Commission allowed the two projects to proceed even though the dams were clearly “reviewable” projects under the Act and should have first been referred to the EAO’s office for assessment. It is a violation of the Act for another government agency to issue an approval for a project without that project first going before the EAO. That did not happen in either the Lily or Town dam cases. More troubling, it appears that the OGC allowed dozens of other dams that qualified as such under provincial Dam Safety Regulations (DSR) to proceed without companies first applying for water licences and submitting plans to Dam Safety Officers, as required by regulation. Dam Safety Officials with the provincial Ministry of Natural Resource Operations are supposed to vet any plans to build structures that qualify as dams under the DSR. Those officials appear in numerous cases to have not been referred dam engineering and construction plans either by the OGC or the companies that built the dams. In at least 57 cases involving unauthorized or unlicensed dams on Crown lands, and numerous other such dams built on private lands, there appears to have been significant regulatory breakdown within the OGC and FLNRO. Recommendation 5. The EAO should conduct a wide-ranging assessment of the Lily and Town Dams that seeks to answer why regulators allowed the projects to proceed without them first being referred to the EAO. This should include a review of the much broader network of unlicensed dams built throughout northeast BC in recent years to corral water used in natural gas industry fracking operations. In closing, I trust that your office will give careful consideration to this request and to those of others who have filed responses to the EAO regarding Progress Energy’s extraordinary and potentially unprecedented request to retroactively exempt the Lily and Town dams from environmental reviews. This submission is published as part of the Corporate Mapping Project, a research and public engagement initiative investigating the power of the fossil fuel industry. The CMP is jointly led by the University of Victoria, the Canadian Centre for Policy Alternatives’ BC and Saskatchewan offices, and the Parkland Institute. This research is supported by the Social Science and Humanities Research Council of Canada (SSHRC). Ben is the resource policy analyst at the Canadian Centre for Policy Alternatives – BC Office. He joined the CCPA staff team in 2005 after years working as an investigative journalist with numerous magazines, and previous to that as a reporter with The Vancouver Sun. He is author and co-author of two books on forestry issues and currently devotes much of his policy research to natural resources, with special attention paid to energy, water, and forest resources and climate change. Sign up for the latest news and updates on corporate power at the climate crossroads. Power and influence in the fossil fuel industry today place sharp limits on our democracy. A research and public engagement project investigating the power of the fossil fuel industry in Western Canada, led by the University of Victoria, Canadian Centre for Policy Alternatives (BC and Saskatchewan Offices) and Parkland Institute. This research is supported by the Social Science and Humanities Research Council of Canada (SSHRC).